The rotating swivel neck gives universal movement providing capability to reach virtually any hard to reach spot. Edge cleaning and pet hair are no problem with this German-designed vacuum cleaner. Uniquely portable and lightweight, the FELIX can be conveniently carried while using an attachment nozzle. Cleaning hard to reach areas has never been easier. Felix is a full featured powerful vacuum. SEBO's 3-step hospital-grade S-class filtration results in 99.9% effectiveness at 0.3 micron, making it the perfect choice for allergy and asthma sufferers. The FELIX also uses unique electrostatic exhaust filter that has 250 square inches of surface and is available in e colorful designs. The 4-level height adjustment allows for optimal cleaning of carpets and rugs. The brush roller action can be turned off with the touch of a button to protect fringes on rugs. 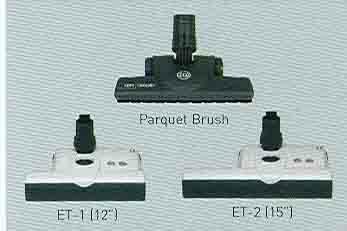 Attach the durable parquet brush for cleaning hardwood floors. Upholstery and crevice nozzles are included for cleaning furniture and drapes. The Classic and Fun models also feature a telescoping handle to adjust to your comfortable handle height. Adjustable, vairiable power control switch for delicate cleaning for drapes and upholstery. Attachments - onboard hose, crevice/upholstery nozzle, SEBO PT-C turbo brush and optional parquet floor brush with either ET-1(12 inch- Classic and Fun Ice Blue-1 models) or ET-2 (15 inch-Ice Blue-2 model ) Power heads. Warranty: All covered with 5-year motor, 3-year non-wear parts and 1-year labor warranty. It is impossible to install the filter bag incorrectly. The filter bag stands upright and automatically finds the correct position with the closing of the lid. The bag is sealed ensuring the dirt is locked in the bag which can be safely and easily removed. You may select two different size Power Head to best serve your need.